PREORDER 12" VINYL & DOWNLOAD HERE https://cosmicbridge.bandcamp.com/album/posthuman-ep Graphs - Posthuman EP 1. Posthuman 2. Falling Inward 3. Broken Legs 4. Sever The Heart Released 14th Dec 2014 https://www.facebook.com/cosmicbridgerecs https://www.facebook.com/graphsmusik The tenth release from Cosmic Bridge sees label head Om Unit add another exciting new artist to his expanding roster, Jason Taylor pka Graphs, based out of Boston, Massachusetts he is the first North American member of a worldwide family that includes Kromestar and Boxcutter and has given us Moresounds, EAN and Danny Scrilla; who after making their debuts for the label have gone on to make waves. After the success of Cosmic Bridge’s last, release the Om Unit curated Cosmology compilation, Om Unit was looking ahead for new blood.... he says “I found Jason through listening to his Ground Mass material. (The burgeoning US label on which Graphs has graced several compilations and ultimately released his debut “Scylla EP”) Graphs to me has this very focused approach, quite singular and monotonal and definately in a sense quite bleak and minimalistic. With “Posthuman” he draws on that robotic notion of the “severed heart”. He touches on the Grime and Footwork styles but maintaining this sense of originality and putting it across in his own way, something which I admire in any artist.” Graphs feels right at home on Cosmic Bridge. On Posthuman he explores the furtive middle ground between UK Drum & Bass and US Footwork. Cold and instrumental but with the potential to ignite, his label debut takes hyperkinetic drums, stringently arranged breaks and darkside synths and develops jittery, tech-stepping, rhythmic patterns with close atten- tion to atmospheric and textural detail. In doing so he provides four tracks of menacing, twitchy Footwork with exceptional potency and proper dread future shock that roll with fluid halfstep D&B and just a hint of old skool Photek. The shapeshifting slow/fast electronic parameters of this record are informed by a noirish backdrop of cyber-surreal dream states and are buoyed by brooding bass and subs that rattle your bones and incite the feet. Jason explains “The “theme” of the album is the dilemma whereby technology allows us to be more than we are, but we often use that power for shallow things. I grew up on drum and bass, and a lot of that music is infused with utopian/dystopian vision. Particularly in names, either very positive or very dark and sinister. My concept here is: what if it was neither? What if it was sort of empty, as if it went on without us or without our intervention? Like how Limbo is in the movie Inception: an empty, crumbling heaven. Posthuman/posthumanism is typically a term that describes a utopian view of what comes next for humanity after some technological singularity, described by thinkers like Ray Kurzweil. So I thought it would be somewhat interesting to consider “what if it was nothing?” or “what if the future didn’t need us?”. 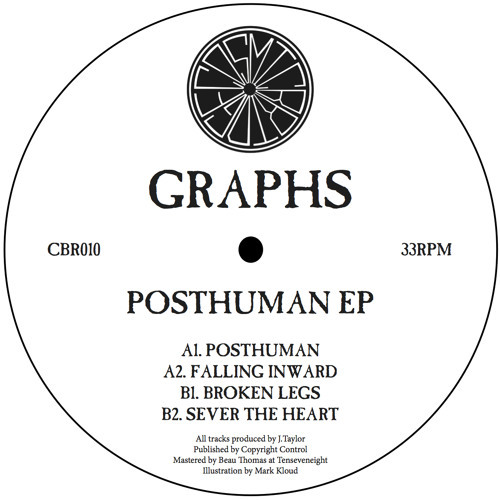 Graphs - Posthuman EP is mastered by Beau Thomas at teneightseven, artwork is by Ground Mass label head Mark Kloud. Thanks for all the kind words, y'all! Love the percussion, really drives the tune. can't wait to play this out!